Get into a festive mood! 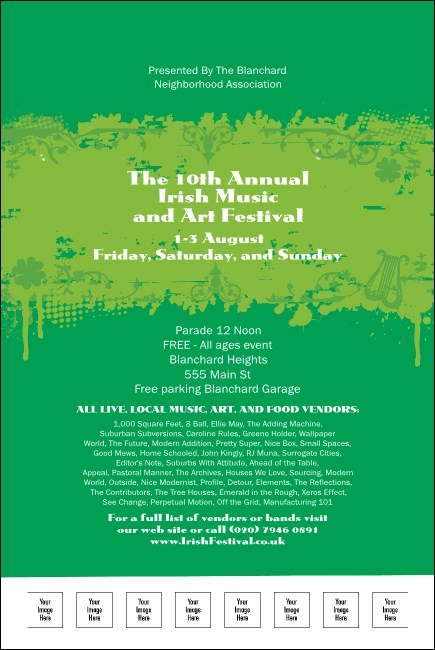 Whether you're celebrating St. Patrick's day, hosting a concert for local bands or just throwing a party, the Shamrock Poster will help you promote your gathering with a sense of national pride. Printed in bright greens and whites, the poster features shamrocks and hearts as well as 8 spaces to upload custom images. Fully advertise your function with matching promotional materials from UK Ticket Printing.